As many of you know I am now eating minimally processed food free at home, and now I am trying to become minimally chemical free. This comes in the area a medicine (both prescription and over the counter) and environmental (cleaning products). This is a very slow process. I am taking my time, learning about each oil and trying it. Mostly to replace OTC medicines right now. This journey actually began 6+ months ago with a large scale research project. All of this led me to a company called Young Living. To read the whole story go to my page entitled Young Living Essential Oils. Last Saturday (11-3-12), I received another order of essential oils and in it came Thieves Household Cleaner. I only bought the 14.4 oz bottle so I could see if it would work. I had to try it. I love my Thieves Lozenges and my Thieves Essential oil so now it was time to give this a try. Now for a back story. I have a had time with most cleaning products. I can feel them burning my lungs and throat. They make me cough and feel horrible. Many times, I feel like I need to leave the house just to breath. So cleaning with products has fallen on Scott. I bought two spray bottles (one for home and one for school), and mixed the Thieves Household Cleaner with filtered water. I actually started here at home before taking it into my school. It had to work on me and my two boys as all of us have fall seasonal asthma so we were a good test market. I used it in my bathroom on one sink - did pretty good! I am impressed - took off soap scum and residue. No coughing, no wheezing, no burning, no yucky feeling. After no problems for a couple of days, I took it to school. I used it immediately. Some of my tables were sticky, so normally I would have to use a Clorox wipe (which make me wheeze and my eyes burn and water and just feel yucky - but it was all I had). I cleaned all the tables and door handles with it. No coughing, no wheezing, no burning, no sick feeling. Easy to use and my room smelled wonderful. I also LOVE the smell of thieves - as do my kiddos. I always have my Thieves Essential Oil on right now to help keep me from getting all the germs that walk into my class. It is funny - the kiddos come up to me and say "You smell so good" and sniff me (remember they are 5). Maybe they will get the benefit from me wearing it. OK back to the cleaner. It worked like a charm. There was sticky leftover juice (from the day before) mixed with whatever they clean the tables with left on one of the tables and some stuck on glue residue. Cleaned it with no problem. Now I have something to replace the Clorox wipes. Everyone who walks in my room, loves the smell. This morning, I woke up and counters had not been wiped down. Normally I would wipe down with water and have Scott use cleaner on it later. I thought - lets give it a try on a much larger scale. I got my Thieves bottle that I had made earlier in the week and sprayed one counter down liberally. No coughing, no wheezing, no burning, no yucky feeling. OK - I decided to try the rest of the kitchen - NO PROBLEMS and it cleaned like a charm. I even used it on my glass top stove. What was even better is I loved smelling the cleaner as I cleaned. My take on the product - I have a love/ hate relationship with it. I love it cleans without making me (or my family) sick. I love that it actually works. I love the smell. I hate it because I will have to start cleaning more now that it does not make me sick. Guess I will buy the bigger bottle next time. 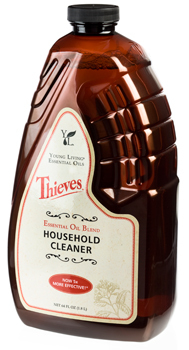 Coming soon - my take on the Thieves Lozenges, Thieves Essential Oil and Thieves Mouth Wash.